G.L. Britton began fly fishing under his father’s tutelage before he was 10 years old on the streams of North Idaho. As an adult, G.L. 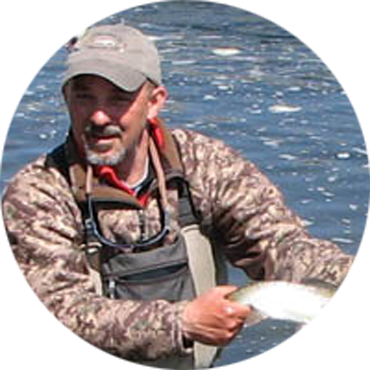 has fished and guided in Idaho, Montana and Washington. An avid steelheader for decades, he also has experienced many of the fabled rivers of British Columbia. He opened and owned the Silver Bow fly shop in Spokane. His interests are eclectic, but are all tied in some way to a great passion for nature and conservation. Beginning in 1999, G.L. leased the recreation on a 4500-acre ranch in east central Washington with almost 5 miles of Crab Creek on the property. While the State allows a 5-fish limit in this watershed, this ranch has been strictly catch and release for 9 years. This has allowed the fish time to grow to the point that an average rainvow is now in the 16-18 inch range with fish hooked almost daily over 20 inches. Learn more about Crab Creek. Call today to book G.L. and get onto the fabulous Crab Creek right away! You will come away with life-long memories!